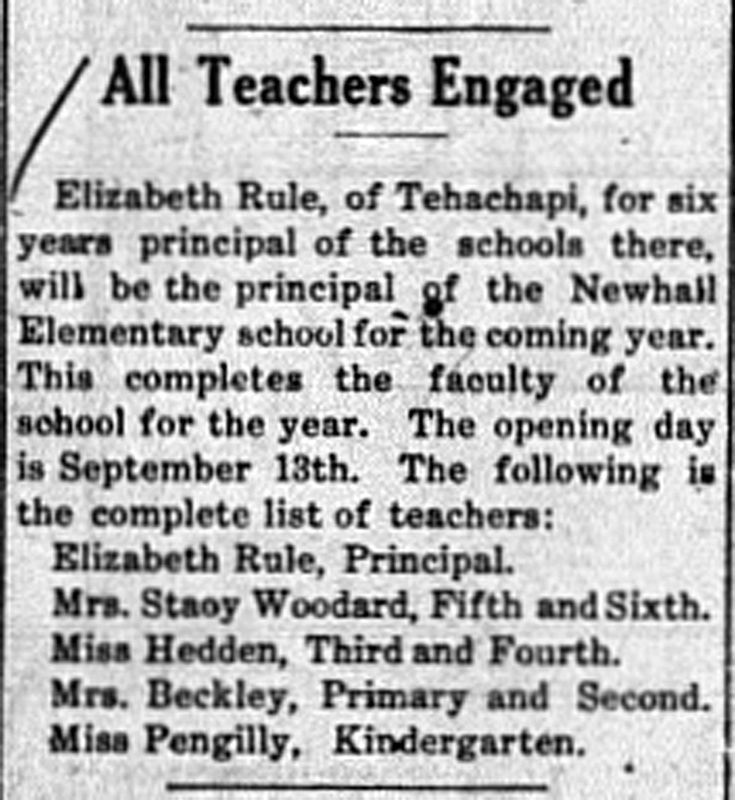 SCVHistory.com | Newhall School | Opening of New (Fourth) Newhall School Site on Walnut Street, 1925. Opening of New (Fourth) Newhall School Site on Walnut Street. Newhall School Board Calls Meeting. Elsewhere among the legal notices we print a notice of the meeting to be held to consider the question of the disposal of the old school property. At that time the Board of Trustees will consider the sale of this property, subject, of course to the order of the meeting. But another matter at that time should be remembered, and it is the desire of the board, that all the patrons and taxpayers should be present at that time for the inspection of the new school house. It is expected that everything will be ready for the opening of the school, with the seats in place, and the new auditorium seats in place, and the people and patrons can see the surroundings of their little ones while acquiring their education. Now let everybody turn out. Public officials like to have their work seen and appreciated, and if the people are satisfied with the showing in the new school house, the board would like to know it. The contracts for all of the teachers have not as yet been signed, and the board does not care to make the names public until they are signed. This statement is in answer to many who have asked the Signal who the new teachers are for the coming year. The Newhall Signal | Thursday, September 3, 1925. The vacation days are drawing to a swift close for the school children of this section. September 14th will mark the beginning of the new school year. Helen Ahrens, principal, seventh and eighth grades. Mrs. Stacy Woodard, fifth and sixth grades. Juanita Hedden, third and fourth grades. 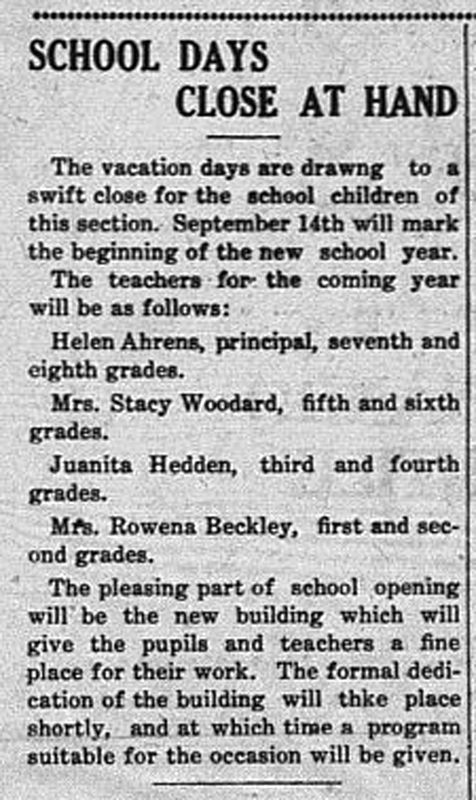 Mrs. Rowena Beckley, first and second grades. The pleasing part of school opening will be the new building which will give the pupils and teachers a fine place for their work. The formal dedication of the building will take place shortly, and at which time a program suitable for the occasion will be given. The Newhall Signal | Thursday, September 10, 1925. 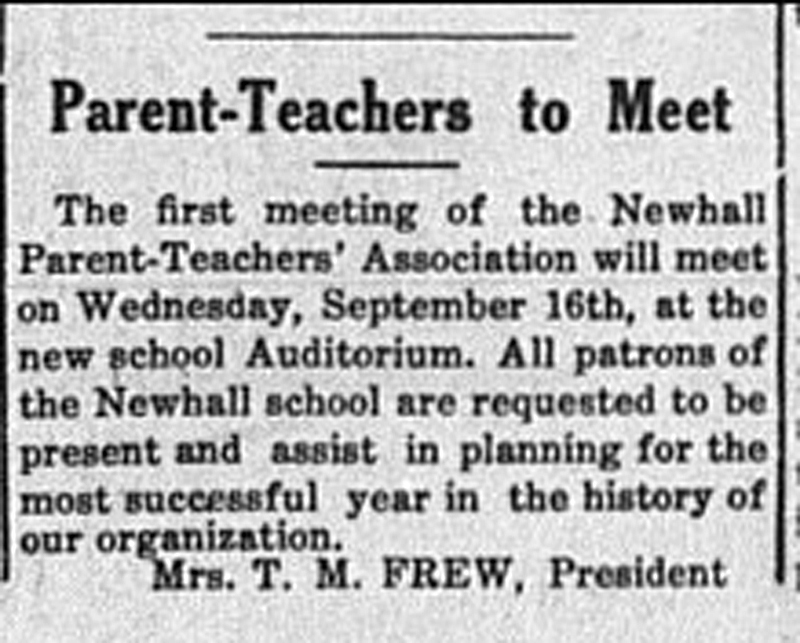 The first meeting of the Newhall Parent-Teachers' Association will meet [sic] on Wednesday, September 16th, at the new school Auditorium. All patrons of the Newhall school are requested to be present and assist in planning for the most successful year in the history of our organization. Mrs. T.M. Frew, President News story courtesy of Tricia Lemon Putnam. The Newhall Signal | Thursday, November 5, 1925. 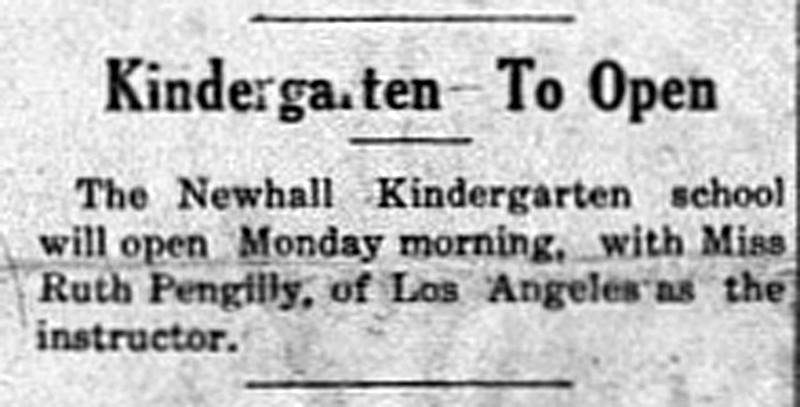 The Newhall Kindergarten school will open Monday morning, with Miss Ruth Pengilly, of Los Angeles as the instructor. 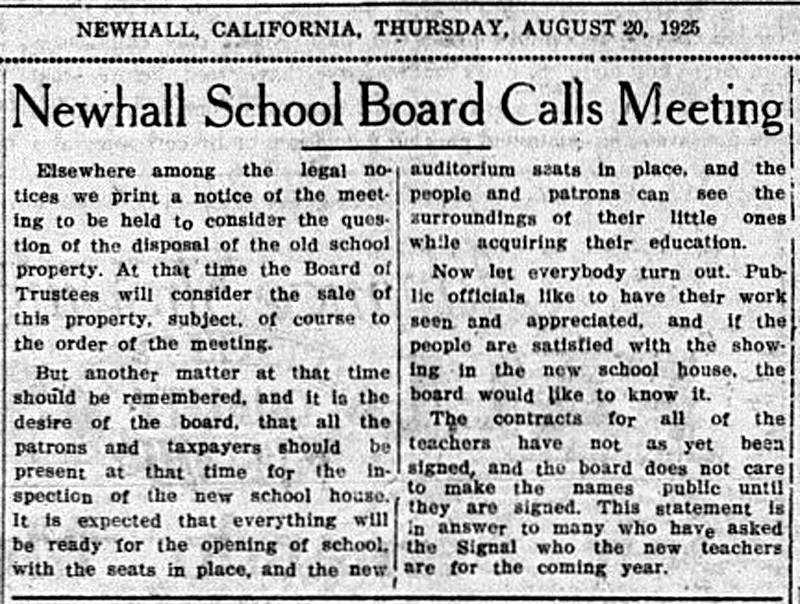 The Newhall Signal | Thursday, August 26, 1926. Mrs. Stacy Woodard, Fifth and Sixth. Miss Hedden, Third and Fourth. Mrs. Beckley, Primary and Second.